ROOF BARS AND ROOF RACKS. Vw T5 Lwb Transporter 4 Man Expedition Roof Tent Camping Travel Outdoor. View Full Range of items for your vehicle. 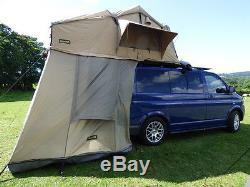 Full 4 man expedition roof tent system for your Volkswagen T5 LWB Transporter. The main section of the tent is made from expedition quality, Oxford nylon material. There is a waterproof cover over the top of the tent to give it extra protection from the elements. The tent folds out neatly using a series of aluminium tubular loops. One of the loops mounts in place to form an entrance cover so you can go in and out but still be under cover. The mattress is a 3 inch thick high density foam with a green washable cotton cover. There are 3 windows on the sides of the tent. The windows also have an insect screen zipped in which can also be fully opened or not. The windows are firmly propped open with stainless steel rods. The base of the tent is aluminium coated ABS plastic. All the material is double stitched and the zips are wide heavy duty. The PVC outer cover is fastened in place with thick Velcro and 2 securing straps. One of the best features of the tent system is the zip on annex at the base of the tent. This provides a whole other room, which can be used to keep a kitchen, your wet or dirty clothing or other items. You even have enough room to sleep 2 children in there. The main annex is made from the same durable and waterproof material that is on the outer of the tent. There is 1 entrance and 2 windows to either side, these all have anti insect netting integrated, so you can have the option of fully opened, open with anti insect netting or fully closed. The rear of the annex has a single zipped exit into the van, this means you can access the van without going outside. The ladder forms the support for the tent and sits within the annex. It has a fully waterproof PVC ground sheet on the floor which is zipped together with the main annex. The material is double stitched and has built in straps to connect the guide ropes to. PLEASE NOTE: The annex section of the tent is only showerproof and therefore will require treating to be completely waterproof. What do I get in the kit? All the fitting and fixtures are supplied for the tent. Full instructions are provided in the kit as well. Please note: This roof tent is designed to fit straight on to our roof racks, it will fit other roof racks or roof rails but you may need to adapt the fixings. Open size: 240cm x 180cm x 130cm. Closed size: 120cm x 180cm x 29cm. The aluminium base has an adonized finish which is corrosion resistant. Material: High denier, heavy duty ripstop polyester, waterproof and polyurethane impregnated. Tent poles: Anodized aluminium tent frame poles. Flysheet: Lightweight, waterproof 420D Oxford flysheet. Flysheet poles: 4mm spring steel durable flysheet poles. Mattress: 60mm high density foam with removable cover. Mattress dimensions: 230cm x 174cm. Ladder: Telescopic anodized aluminium ladder (maximum ladder load is 120kg), extends up to 2m. Travel cover: Heavy duty 600GSM, 500D polyester travel cover, with zip for complete waterproofing, UV resistant straps. Packaging size: 125cm x 180cm x 32cm, G. VAT is included in the price and a receipt will be sent to you. Quality Direct 4x4 Manufacturing Ltd, source the best possible products, from the best suppliers. Product lines include side bars, running boards, roof racks, roof bars, spare tyre covers, rear ladders, rear skid bars, and tail light guards. Many of our suppliers are proud to be OEM (original equipment manufacturers) suppliers of KIA, HYUNDAI, HONDA, NISSAN, GMC, ISUZU, JMC, TOYOTA, VOLKSWAGEN EUROPE and JEEP. These products are tested to reach the exacting standards of the vehicle manufacturers, which means you receive all the benefits without the OEM price. A VAT receipt will be sent out with the goods. Please allow extra time if you are paying by cheque. 3472240 Unit 2, Masons Pl, Nottingham Derby. DE21 6AQ, to the customer named on the order form. All orders are classed as accepted once the order has been dispatched. Any correspondence before dispatch is simply an acknowledgement of receipt of the order. We accept cheques, postal orders and bank transfers. If you wish to send a cheque or postal order, please send to our postal address (above). Goods will only be sent out for cleared funds. You must take care of goods whilst they are in your possession and, if you are returning them, you should take reasonable care to ensure that Direct4x4 receives them and that they are not damaged in transit. This policy does not apply to personalised items (printed wheel covers, painted wheel covers and transfers). Please use the return address. Please check your goods upon receipt; we need you to notify us of any damages as soon as possible. Sign up for our Newsletter. The item "Vw T5 Lwb Transporter 4 Man Expedition Roof Tent Camping Travel Outdoor" is in sale since Thursday, March 30, 2017. This item is in the category "Vehicle Parts & Accessories\Car Accessories\Touring & Travel\Other Touring & Travel". The seller is "direct4x4" and is located in Derby. This item can be shipped worldwide.